This tent is 1600 sq. ft. and will seat 160 to 200 people with tables and chairs (rented separately). Available in bright white. with tables and chairs (rented separately). Available in bright white. This tent is 3200 sq. ft. and will seat 320 to 400 people with tables and chairs (rented separately). Available in bright white. This tent is 4000 sq. ft. and will seat 400 to 500 people with tables and chairs (rented separately). Available in bright white. 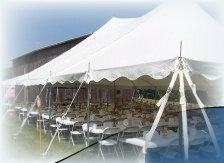 40 x 120, High Peak This tent is 4800 sq. ft. and will seat 480 to 600 people with tables and chairs (rented separately). Available in bright white.